We are about empowering young people to make a positive change. For over 100 years, JCI members around the world have acted on one shared belief - the improvement of our society and environment is paramount, not just for us but for future generations too. 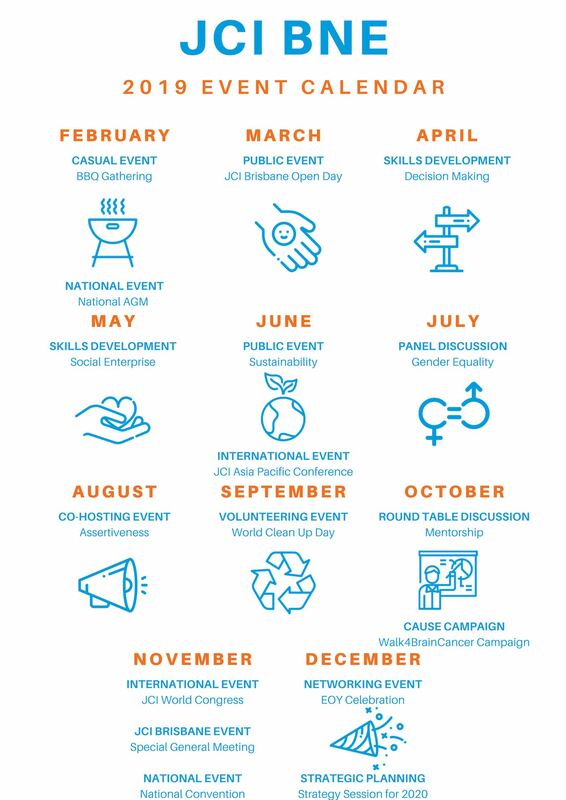 Based in the heart of Brisbane, we work closely with a number of different local community organisations throughout the year to deliver impactful programs with a strong focus on personal development through workshops and seminars. We welcome your participation and look forward to welcoming you to our events. Meeting like-minded people who have a passion for improvement is at the heart of everything we do – it is what makes JCI so effective in changing the world. Our regular social and networking events will help you make friends for life and establish meaningful, long lasting professional networks. Through local, national and international leadership roles, you’ll widen your business skill set and gain valuable experience which would be otherwise unavailable to young professionals. You’ll be offered opportunities to travel internationally and take advantage of regular professional workshops to ensure you’re always improving, gaining new experience, and having new adventures. Improving our local communities and wider society underpins everything we do. We create innovative and sustainable solutions to challenges faced by communities at home and around the world. Our initiatives and fundraisers raise awareness and provide much needed relief for those in need. JCI Brisbane is committed to providing strong career development opportunities that benefit our members and make a positive impact on the community. providing genuine experience to build your CV and improve the community in which you live.